Oh heavens but I am tired today. I worked hard all day! BUT I wanted to spend time with God today yet, so we are. We’ve finished off John 12 and now move on to John 13, the first 20 verses. Last time we talked, Jesus was talking to the people that were gathering for the Passover. It is still pre-Passover feast, and Jesus knows that his hour has come. He would soon leave this world to go to the Father, having loved his own who were in the world, he loved them to the end. Tonight we were reading from our catechism and it talked about the suffering of Jesus… from the very moment he came to earth, leaving his infinite life for a finite one with all the cares and concerns that brings. But he came and in his coming is LOVED this own who are in this world. He loved them until the end. See what Jesus does in the love that he has for his own. He knows that Judas Iscariot is going to betray him, he knows what the future holds for him. He holds these things that he knows. See what he does. He takes up a towel, ties it around his waist and takes up a basin and fills it with water. 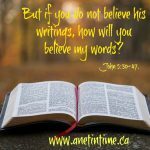 Can you imagine what the disciples must have thought? When I read these lines, especially with the follow up… It’s like shock and horror mixed together. How could Jesus do this? Jesus was not a servant, he was a leader, a teacher, a master. Servants wash feet. But watch Peter’s response to Jesus’ answer, “If I do not wash you, you have no share with me.” 9 Simon Peter said to him, “Lord, not my feet only but also my hands and my head!” Oh, that eagerness makes me smile! Peter is so in love with Jesus, and he simply won’t risk not being part of him. He immediately back tracks. I love Jesus’ response. I can almost see him smiling as he responds to Peter’s enthusiasm. 10 Jesus said to him, “The one who has bathed does not need to wash, except for his feet, but is completely clean. And you are clean, but not every one of you.” 11 For he knew who was to betray him; that was why he said, “Not all of you are clean.” Jesus makes it clear though that he knows that not all of those present are good folk. Jesus went all to explain what he did. He gave them “legs” on the table he had set. 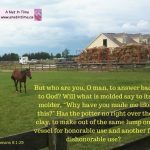 12 When he had washed their feet and put on his outer garments and resumed his place, he said to them, “Do you understand what I have done to you? 13 You call me Teacher and Lord, and you are right, for so I am. 14 If I then, your Lord and Teacher, have washed your feet, you also ought to wash one another’s feet. 15 For I have given you an example, that you also should do just as I have done to you. 16 Truly, truly, I say to you, a servant is not greater than his master, nor is a messenger greater than the one who sent him. Jesus is clear though… his words are not for everyone. They are for those who has chosen. He is telling them now so when it comes time for them to know and understand, they will understand. He tells them that one of them among them has lifted his hand against him. (This is a fulfillment of scripture). 17 If you know these things, blessed are you if you do them. 18 I am not speaking of all of you; I know whom I have chosen. 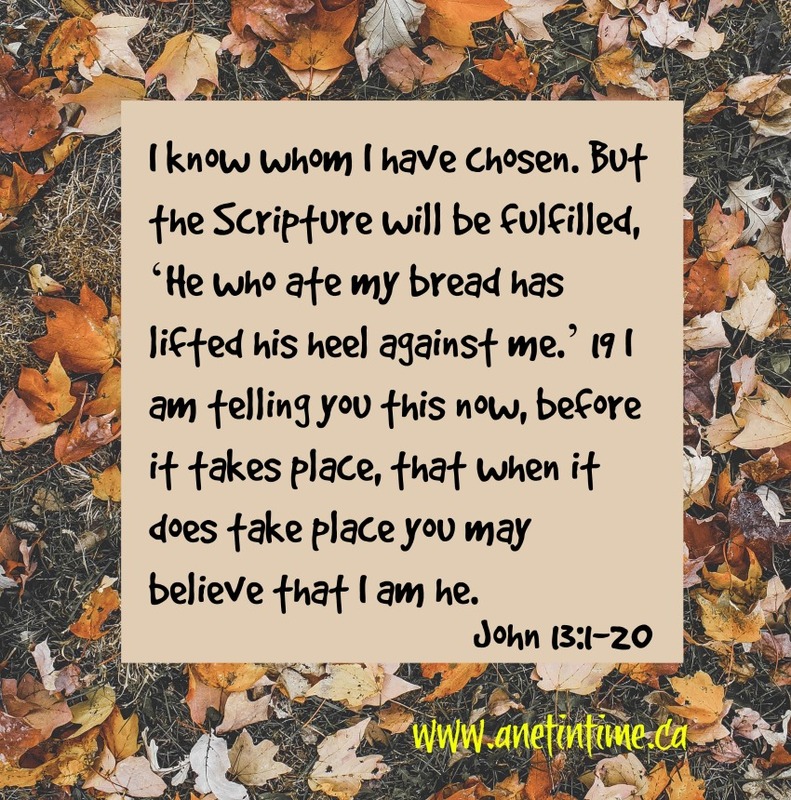 But the Scripture will be fulfilled, ‘He who ate my bread has lifted his heel against me.’ 19 I am telling you this now, before it takes place, that when it does take place you may believe that I am he. 20 Truly, truly, I say to you, whoever receives the one I send receives me, and whoever receives me receives the one who sent me.”. I wonder if that was a comfort to them. Afterwards, to know that Jesus wasn’t surprised by the betrayal of Judas. Followed by the reassurance about the reciprocity of receiving Christ is receiving God and vice versa. Judas wasn’t chosen, other disciples were, and Jesus knows the difference between the two. Did you notice though? Jesus washed the feet of all the disciples, not just the clean ones.